Card Text Each enemy Brobnar creature gets –2 power. 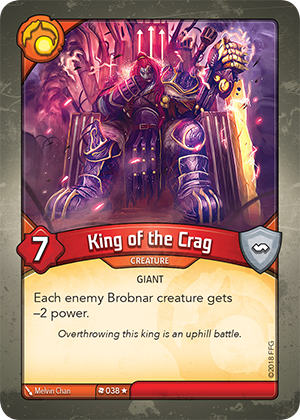 Flavor text Overthrowing this king is an uphill battle. What happens if King of the Crag reduces a creature’s power to 0 or lower? If at any time a creature’s damage is equal to or greater than its power, it is destroyed. Therefore, even an undamaged creature (0 damage) will be destroyed if the creature’s power is reduced to 0 or lower. What happens if after reducing a creature’s power, its damage is equal to or greater than its new (lower) power score? If at any time a creature’s damage is equal to or greater than its power, it is destroyed. Therefore, in that scenario, the creature is destroyed.